Charles Rennie Mackintosh (June 7, 1868 � December 10, 1928) was a Scottish architect, designer, and watercolourist who was a designer in the Arts and Crafts movement and also the main exponent of Art Nouveau in Scotland. Charles Rennie Mackintosh was born one of eleven children in the Townhead area of Glasgow, close to Glasgow Cathedral. From these beginnings, he has become one of the most celebrated architects and designers of his generation. Mackintosh was one of the earliest of the British designers to utilize the Art Nouveau style. A designer, architect, interior decorator and painter, at the turn of the century he found himself in the midst of a period of "Revivalism". In England, all things Gothic or Medieval were the rage, while the Scots loathed the Gothic and favored Classicism. Mackintosh developed a new sense of style, classical in theme, yet bolder and more stoic than expected. The linear, decorative style of the art nouveau movement, with it�s stylized imagery taken from both human and plant forms, was his call to ornamentation. He took his inspiration from Scottish traditions and blended them with the flourish of Art Nouveau and the simplicity of Japanese forms. Much of his work has survived. It can be seen today alongside that of his close collaborators in the group known as "The Four" and the other artists and designers who collectively created "The Glasgow Style". In 1898 he began the most significant of all his works, the Glasgow School Of Art Building. 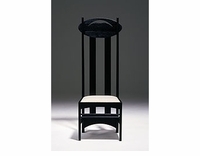 Completed in 1907, this bold form remains the most enduring statement of Mackintosh�s work. Mackintosh's designs gained in popularity in the decades following his death. His House for an Art Lover was finally built in Glasgow's Bellahouston Park in 1996, and the University of Glasgow (which owns the majority of his watercolour work) rebuilt a terraced house Mackintosh had designed, and furnished it with his and Margaret's work (it is part of the University's Hunterian Museum). The Glasgow School of Art building (now renamed "The Mackintosh Building") is regularly cited by architectural critics as among the very finest buildings in the UK. The Charles Rennie Mackintosh Society tries to encourage a greater awareness of the work of Mackintosh as an important architect, artist and designer. It is his furniture designs are what keep his name circulating today.